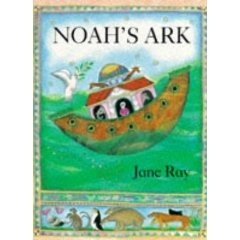 Here you go, have a look at this beautiful, beautiful Noah’s Ark the words are from the Authorized King James Version of the Bible and illustrated by Jane Ray. Everyone has heard the story of Noah countless time, it is a classic tale from generation to generation. And who doesn’t love it!!! So how do we make it memorable instead of rote. It is the one Sunday School class that you can be sure your children will do – a cardboard ark with little animal stickers spattered all over it. It is one of those art classes where you can be sure that every child will know the story and be able to make an art work with from it… So how does one make it memorable? 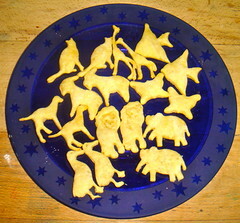 And quick animal crackers – roll out some puff pastry (I always have a packet in the freezer) and stamp out some animals, using cookie cutters and sprinkle with castor sugar. 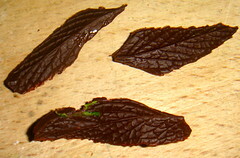 Bake in a medium oven for about 8 minutes until they are crispy. And if you really want to go the extra mile then make a rainbow cake. Absolutely everything you might need regarding Noah’s Ark from MSSSCrafts. A Lesson Plan from eBibleteacher. And here a great bunch of links from Annies Homepage. Packed with just the sort of questions your kids will ask you… and links to the answers!!! If you would like to win this stunning book then go ahead and enter our GiveAway. The GiveAway works in the usual way, comment before the end of this coming Friday, 20 November 2009, and we will draw and publish the winner next week on Sunday! – I won’t respond to your comments as I do on our other posts because I don’t want to be included in our own giveaway. Oh I love it! That looks like a brilliant book and thanks for all the great ideas. This book looks wonderful!!! Please enter my name in your draw. Thanks. We sleepy knitters would be happy to have that book! We are bringing on a new little knitter from the same orphanage as our first, and I hope he will be as avid a reader as his big sister. By the way, I did order that Bruchko book for my college research writers’ book report unit, and my students are loving it so far. Thank you for the review last spring! well, since last week went so well, I might as well enter again. Always love a good bible story with pictures! My oldest is fascinated by the ark story. When we did our thanksgiving project and I asked her what she was thankful for this year she listed “that Noah built the ark” as one of her top five! -She’s only 3! Love your ideas to encorporate more ark stuff to encourage her love of learning. 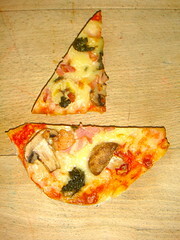 Thanks for the awesome blog! Yes we are in, Thanks my little boys love this story. We have Jane Rays – The Story of Chritsmas from the library at the moment, it is beautifully illustrated! Would love Noahs Ark! Thank you, count us in! We would love to try again to win, last chance before we head home to Israel. Its been great visiting SA! Ooh, I’ve just had that book from the library, it’s gorgeous. Would love to have it on our shelf permanently!! Wow… I’d love a beautiful version of Noah’s ark to read with my 2 and 4 year old… especially a KJV one. I love your ark, animals and minty leaves. And I love the story on Noah’s ark. This is a wonderful book to own, so please count me in. Count me in! My kids love books! looks like a great book, my girls and I are studying through the OT right now and that would be a delightful resource to add! and all the animals! So we would love to enter for the Noah Ark book. Blessings! This looks lovely, please enter me for a chance. Loved all the activities you did as well!